Portfolio containing suite of eight chine collé etchings, including cover page. Printed on Rives heavyweight paper. Etchings are of containers that I own, hence the pun on the line in the marriage vow. Some of the objects are expensive, made by famous designers, whereas others were picked up at flea markets. But all are objects that I treasure for their elegant design and artistry. 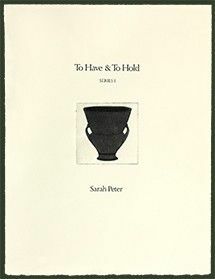 Cover page features a Weller urn.